Dorothy Livesay is one of Canada’s most popular and admired poets. She wrote strong poetry during a time in history when the role of women was stereotypically to be passive, submissive, and a housewife or mate. She caused waves and is now admired for the confidence and forcefulness her poetry includes. 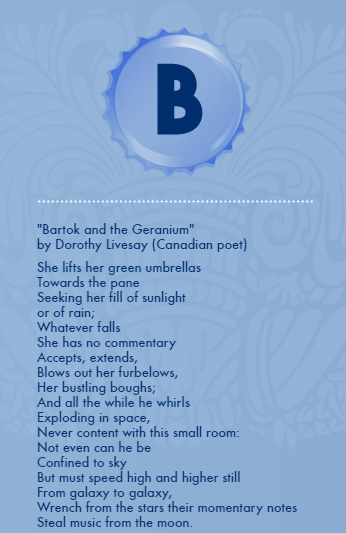 The poem of “Bartok and the Geranium” is one of contrast between a soft, quiet living thing compared to a busy, aggressive, smashing living thing that interrupts the environment it invades. Read it and see if you can make comparisons of this poem to another of Canadian literature that you’ve studied recently. 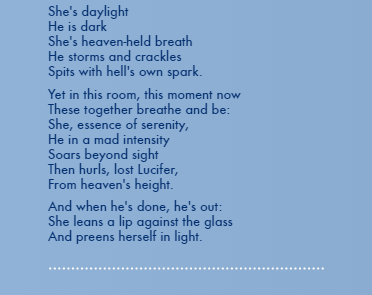 You can read the poem in one piece here at this Noteography site where I have published it, or read the two images together below. It’s also been shared on #Twitter. Steal music from the moon. Spits with hell’s own spark. And preens herself in light. In the A30 course, you’ll read a non-fiction and a fiction novel. Everyone has their own preferences and interests in what they’ll spend their time reading about, so I have several options for you to choose from for both these types of novel choices this year. You can click on the link to learn more about the novel or read ratings/reviews to help you make your choice. If you have an idea for a replacement for either of these genres of books, talk to me and we can maybe include it in the list.